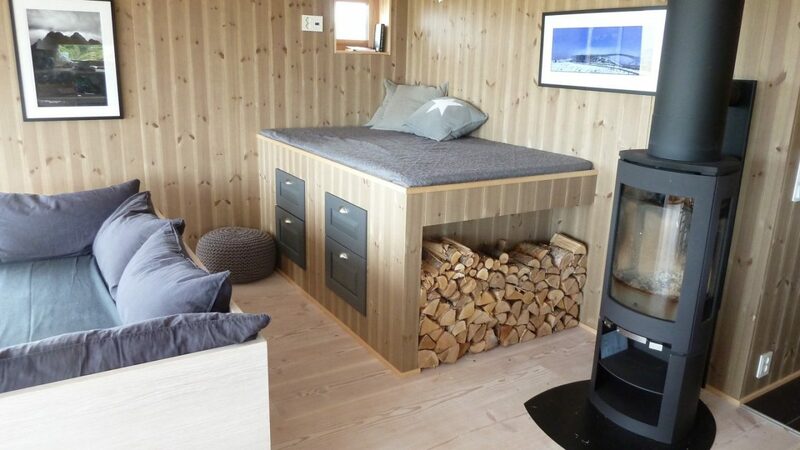 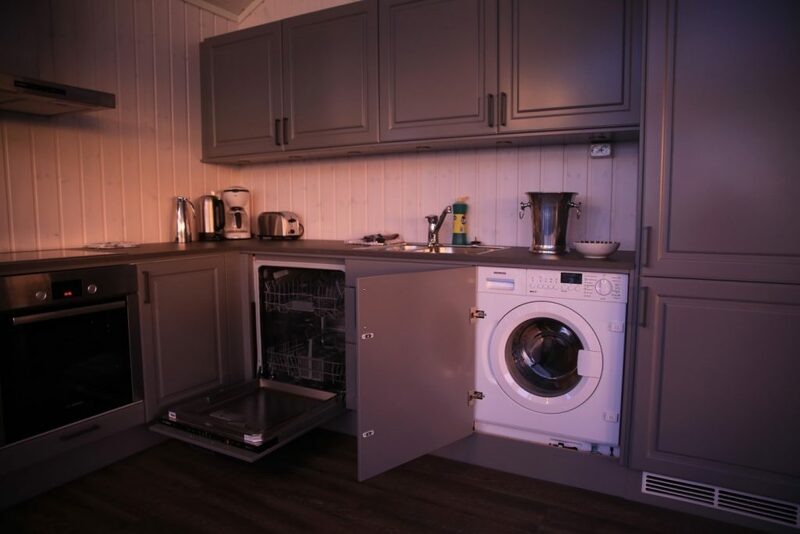 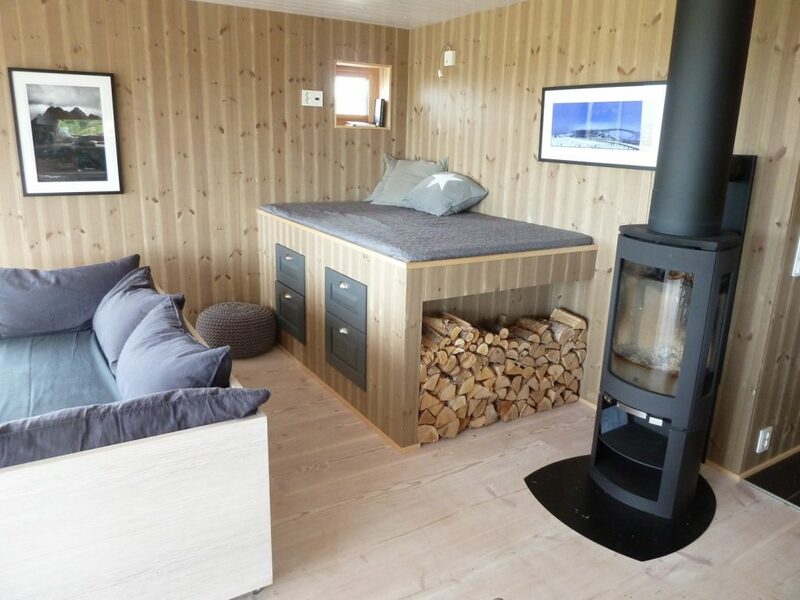 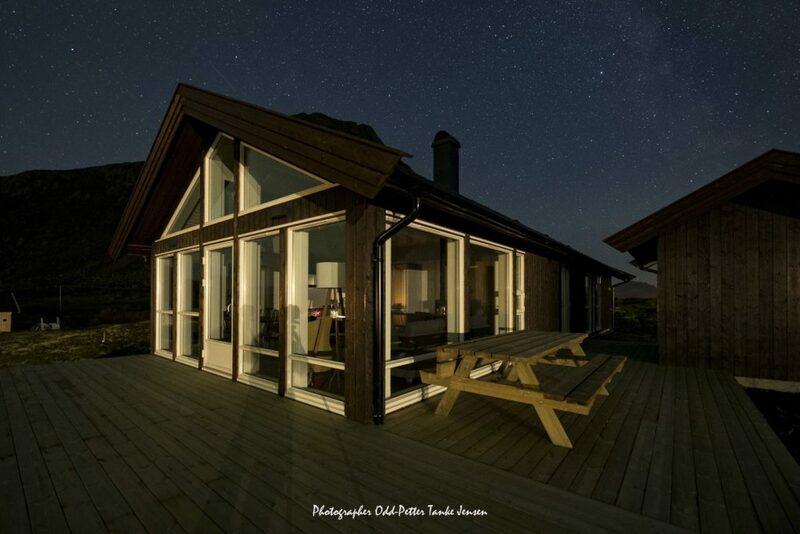 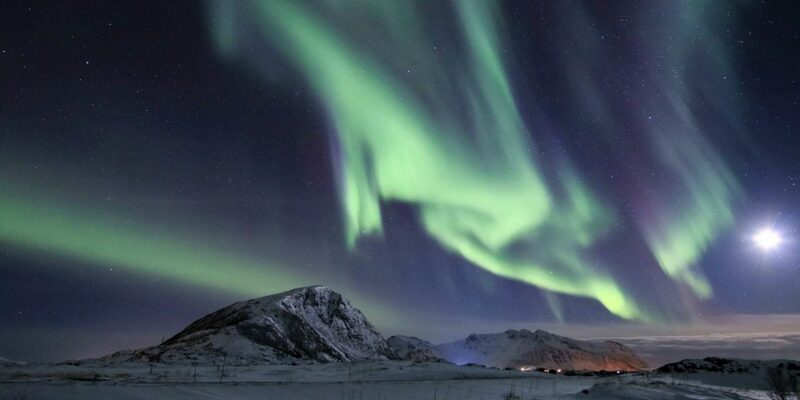 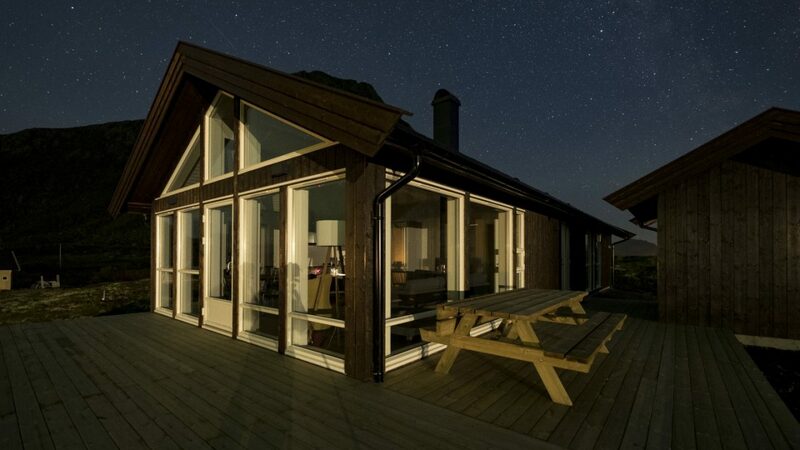 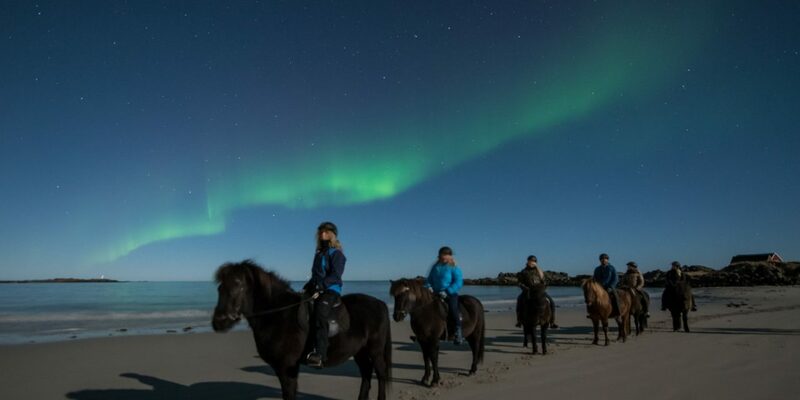 We offer accommodation in brand new, high standard lodges just off the beach at Hov and they make the perfect place for your northern lights base camp. 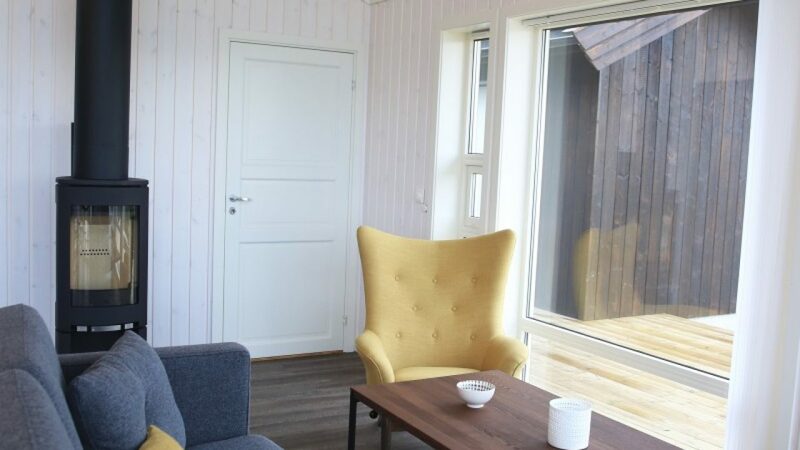 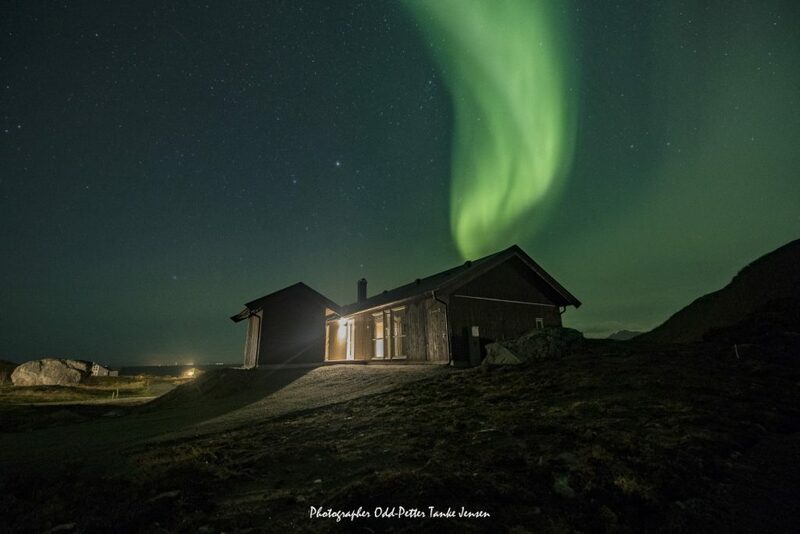 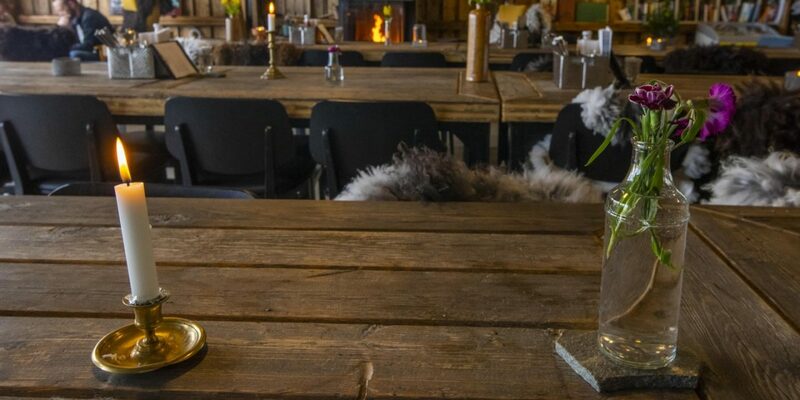 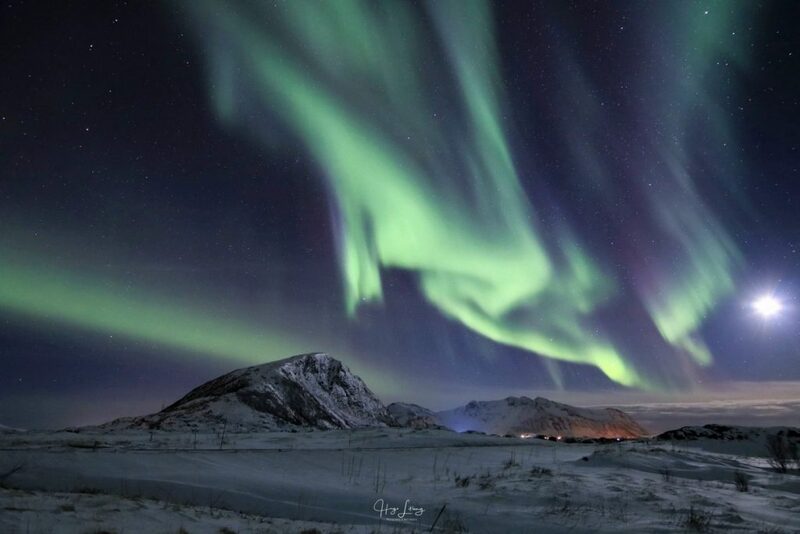 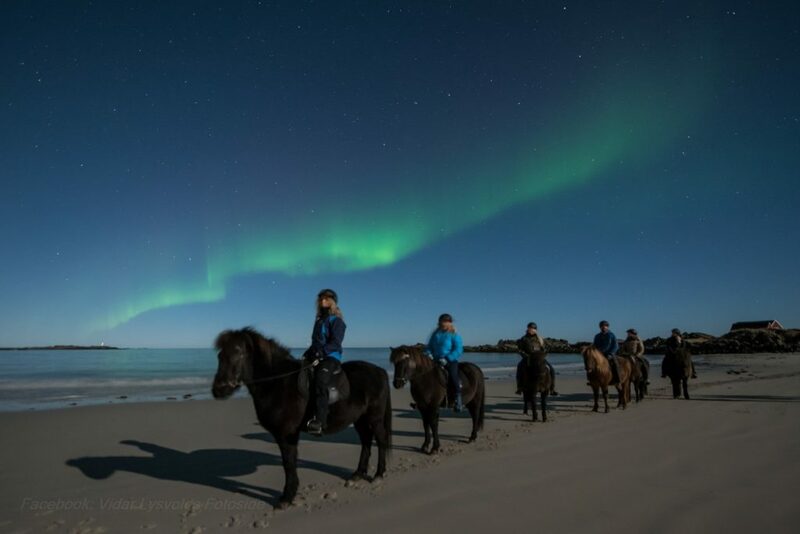 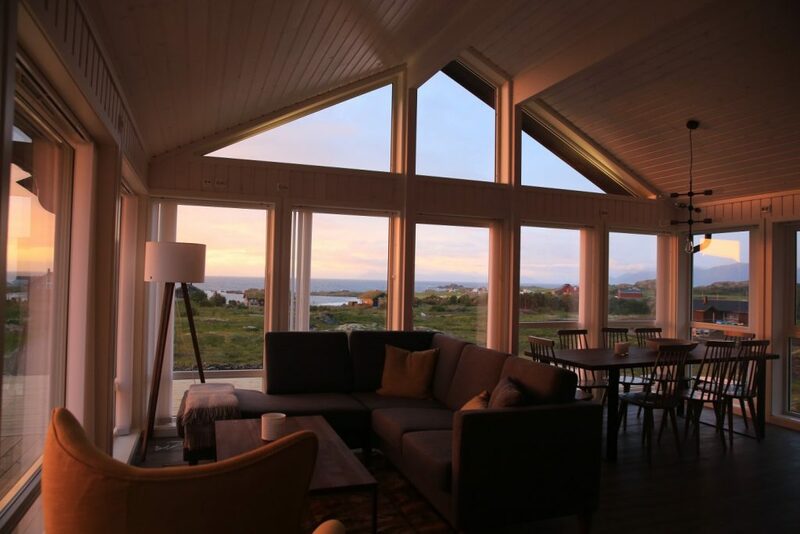 Experience all what Lofoten has to offer and come back to enjoy the northern lights right from the comfort of the sofa and warmth of the fireplace. 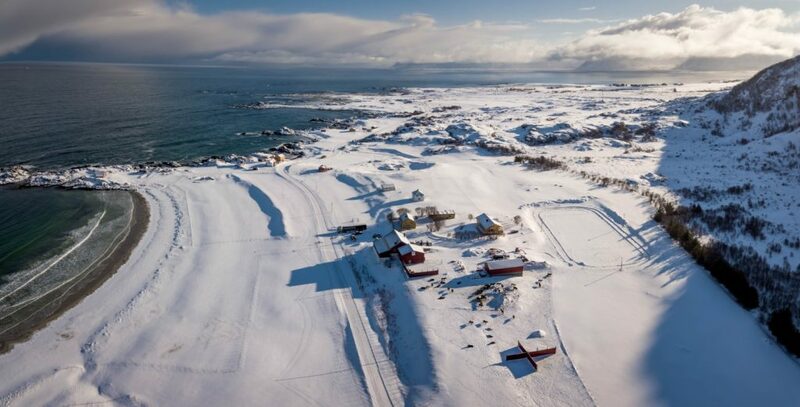 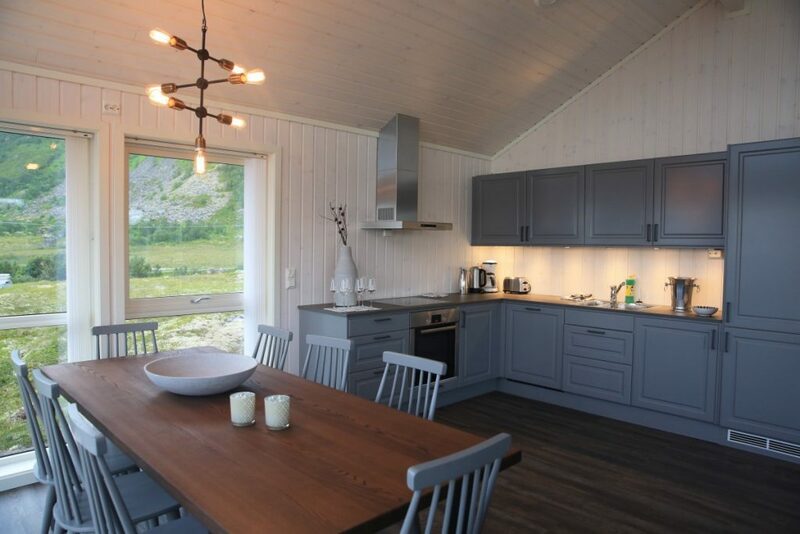 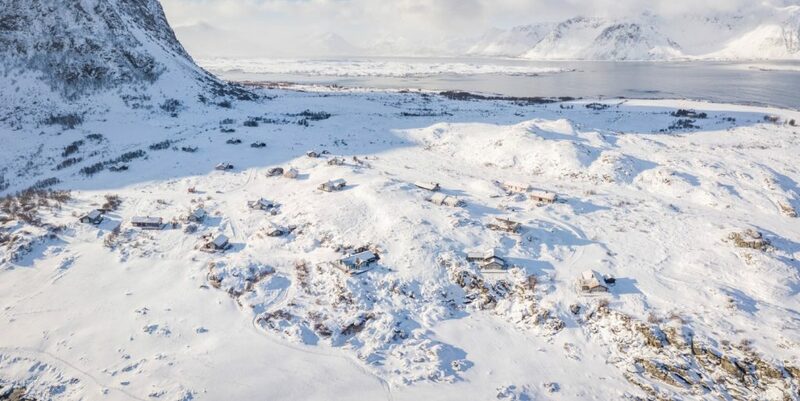 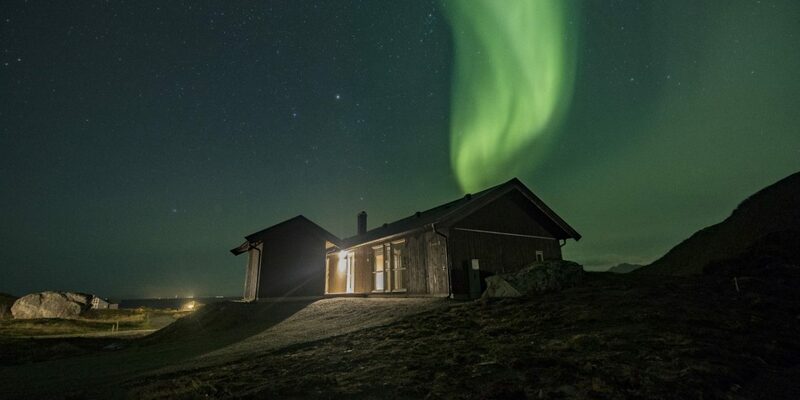 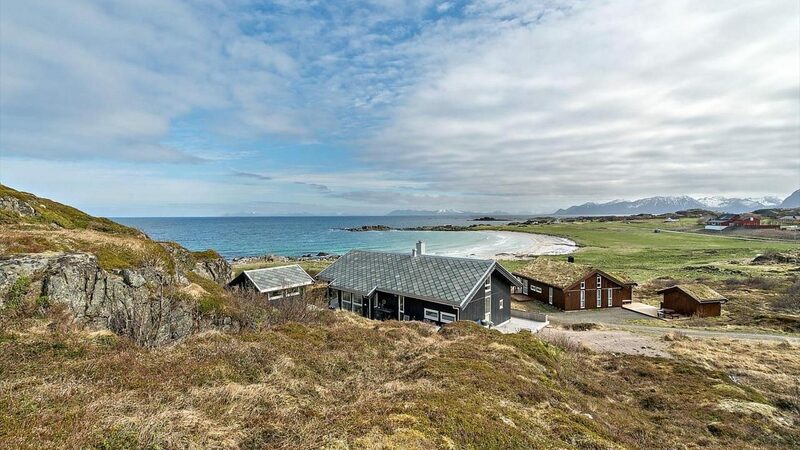 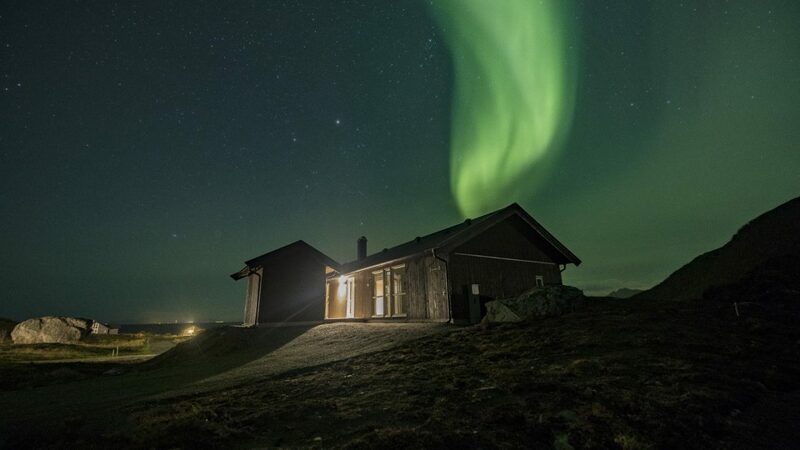 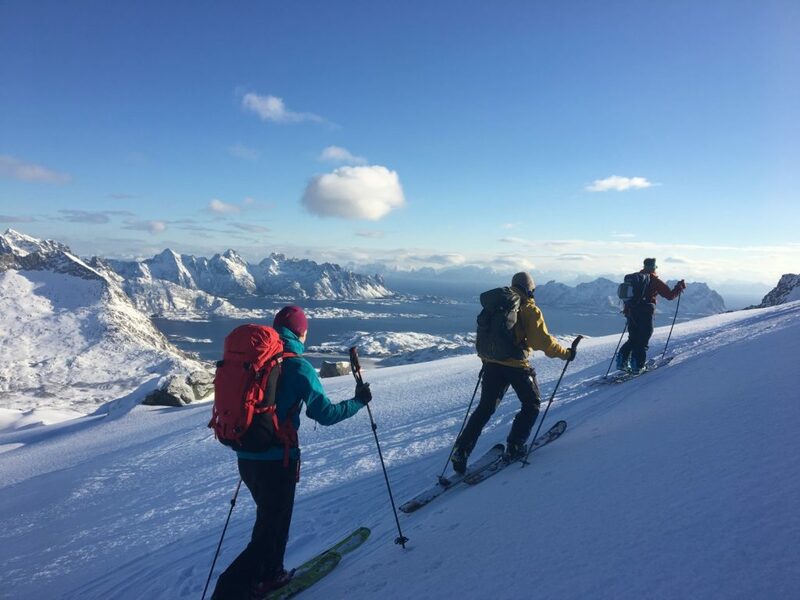 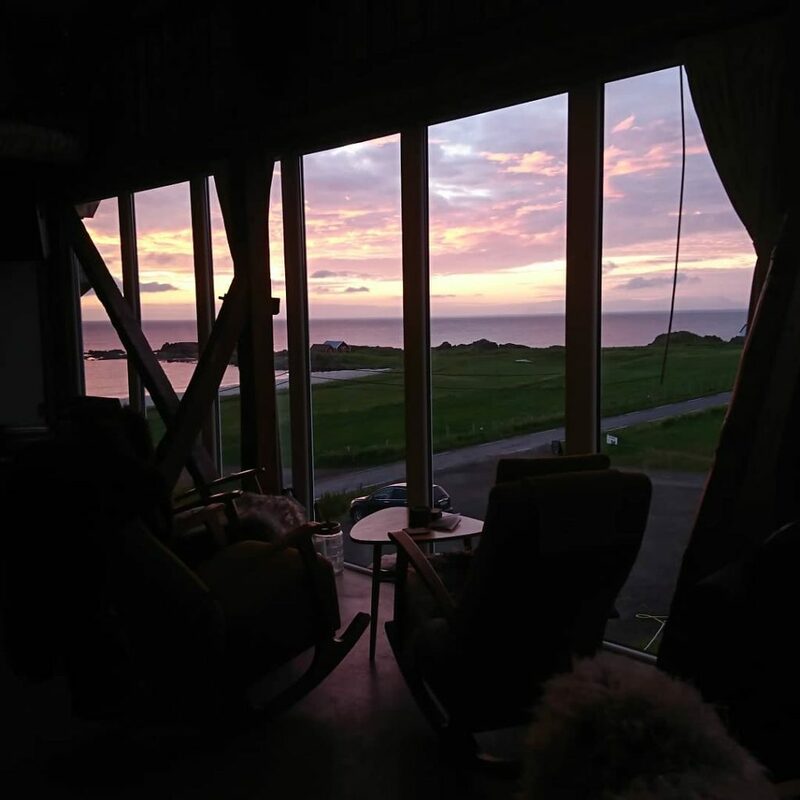 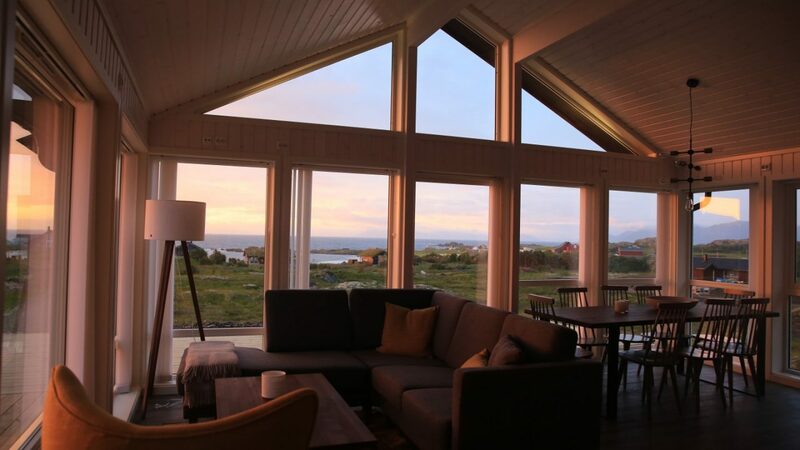 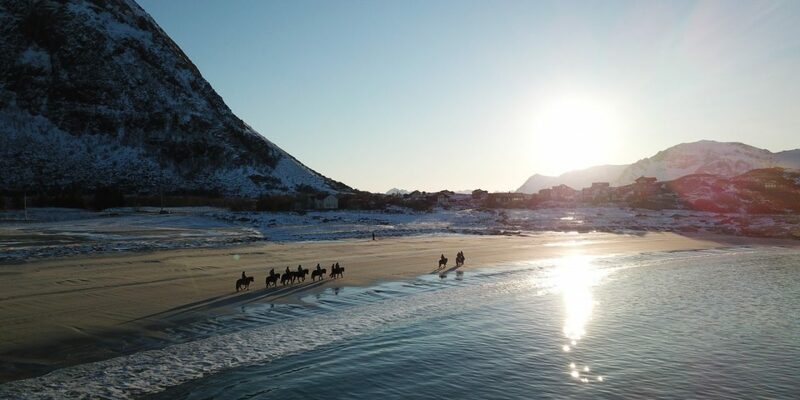 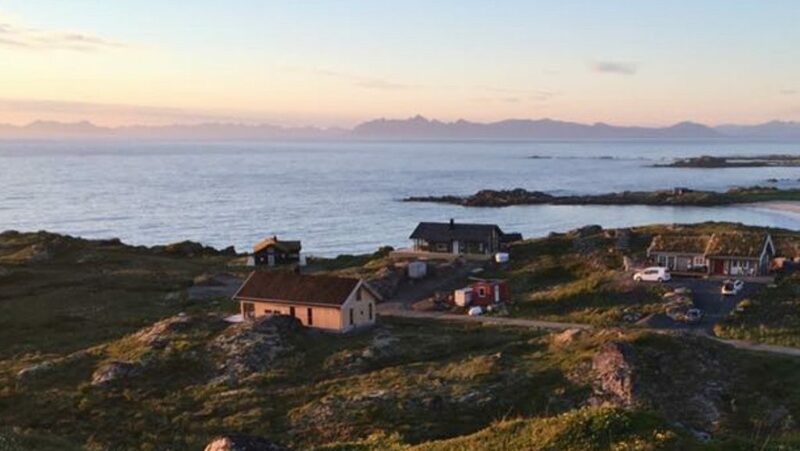 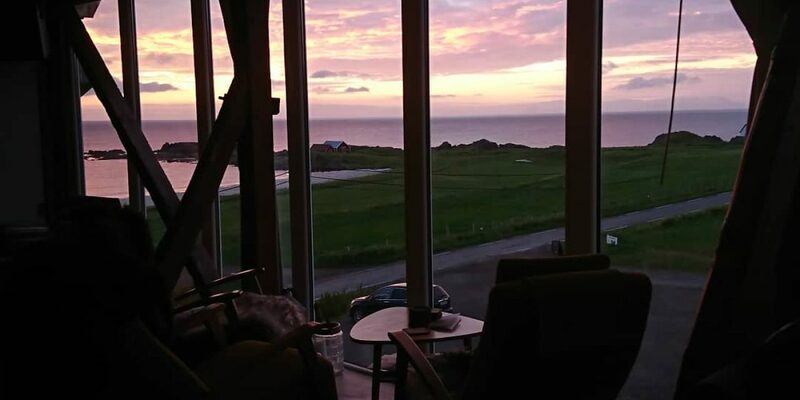 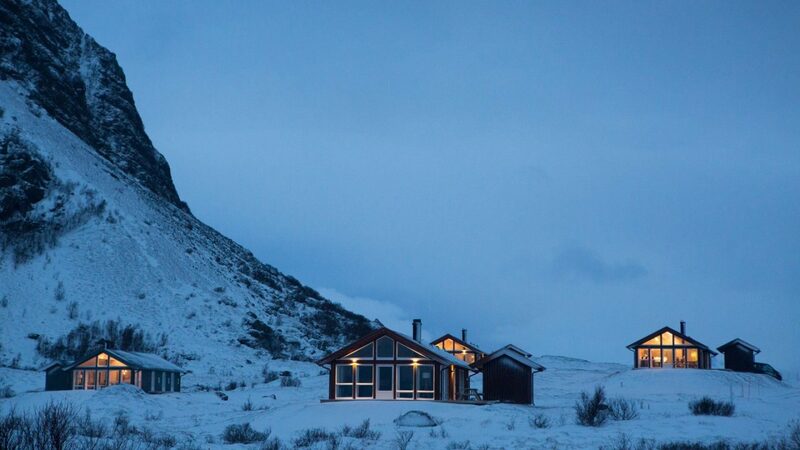 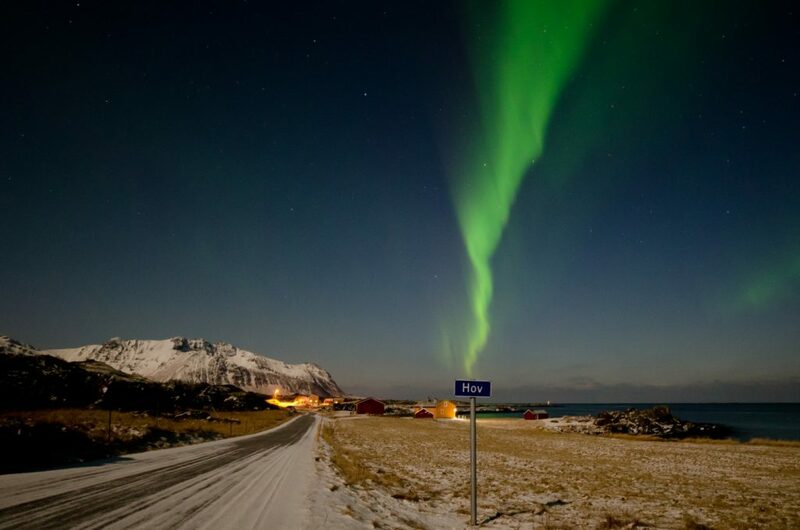 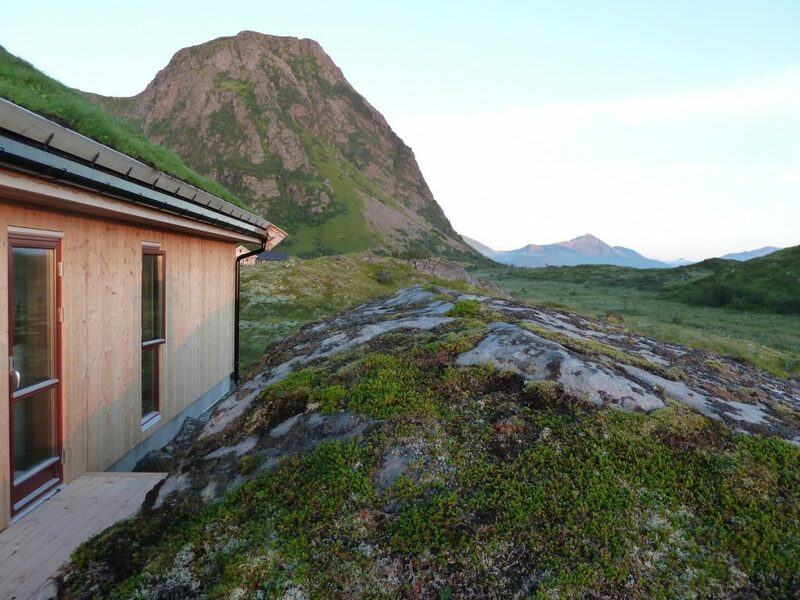 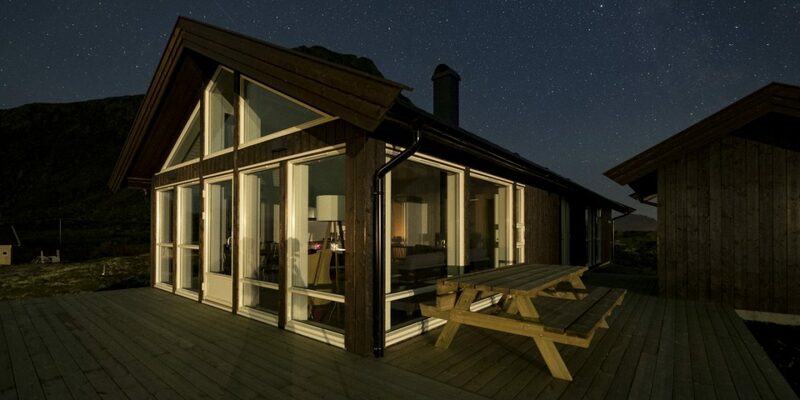 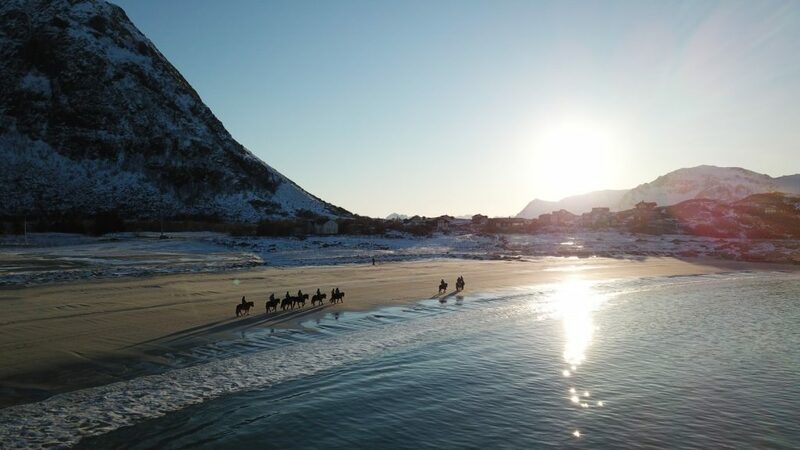 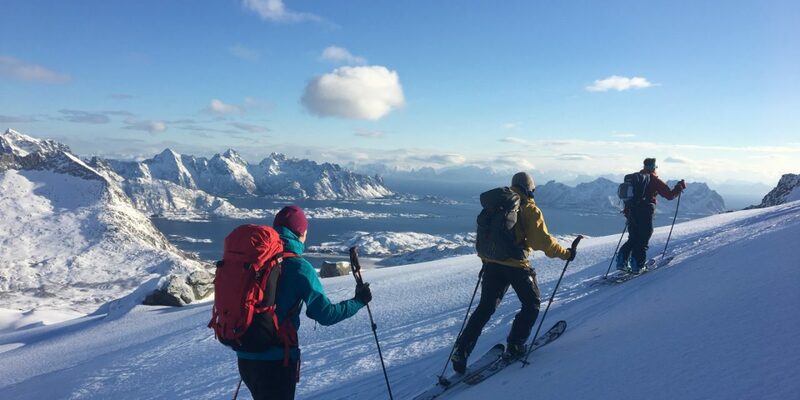 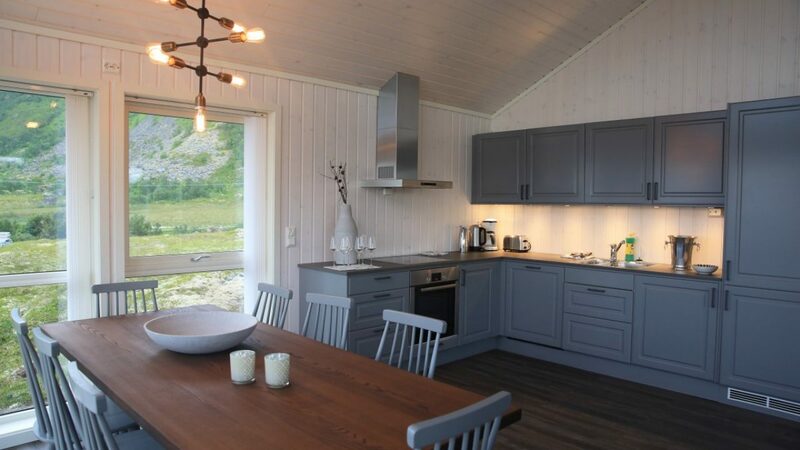 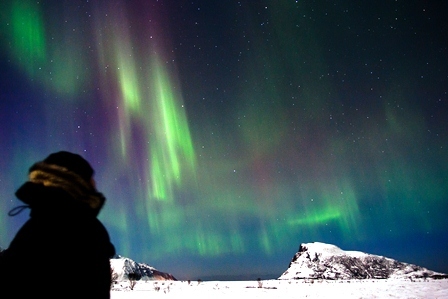 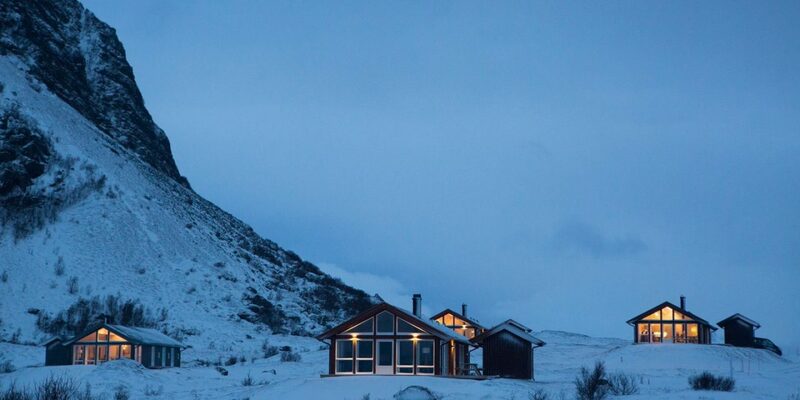 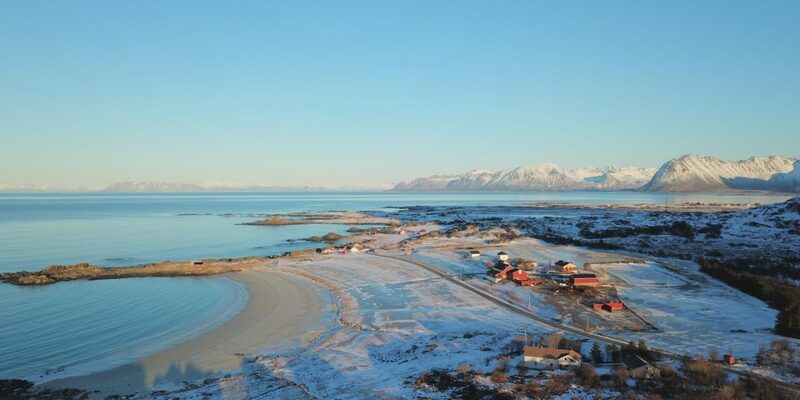 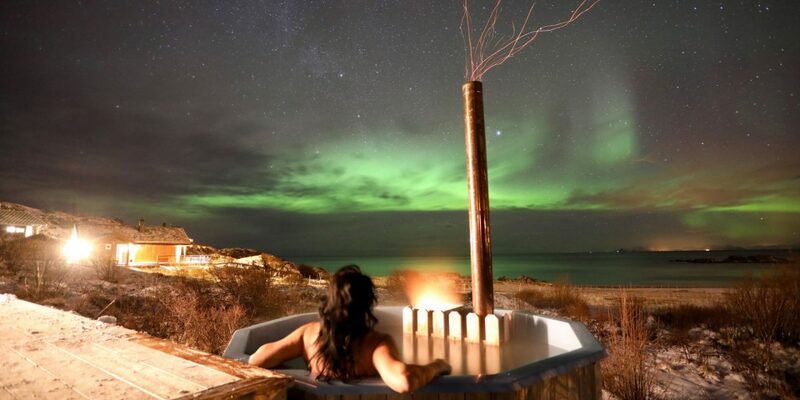 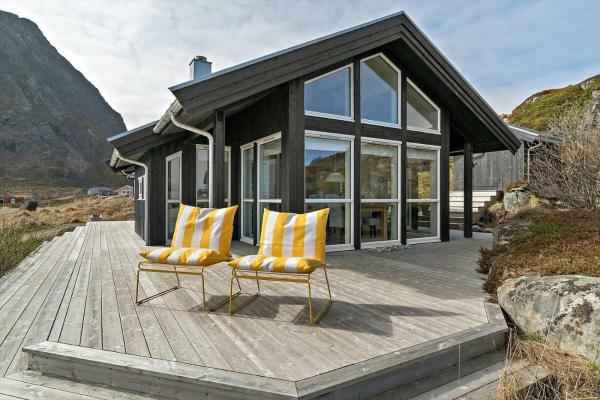 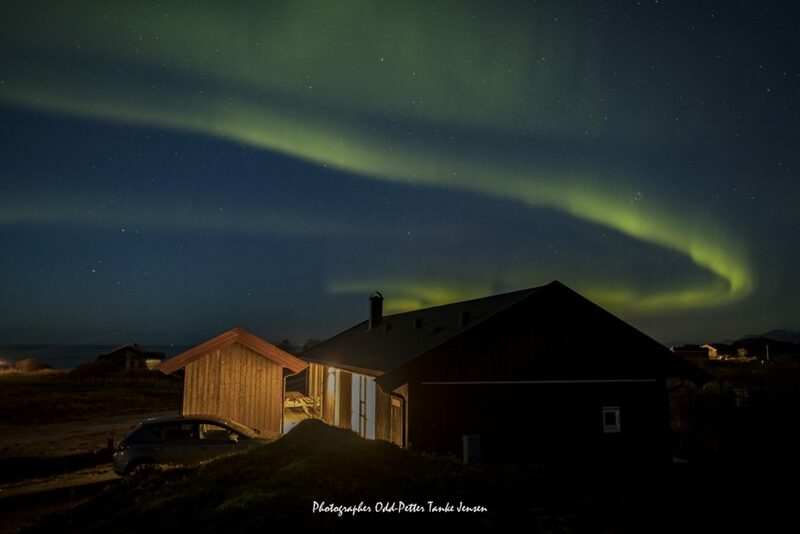 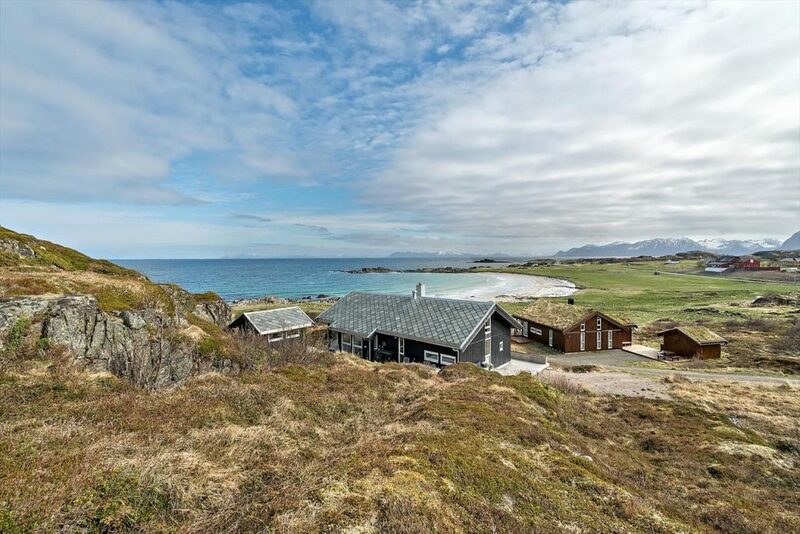 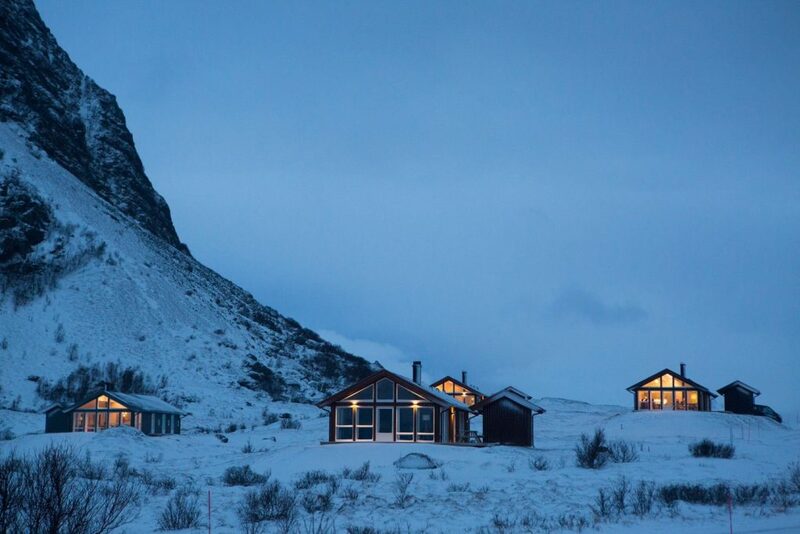 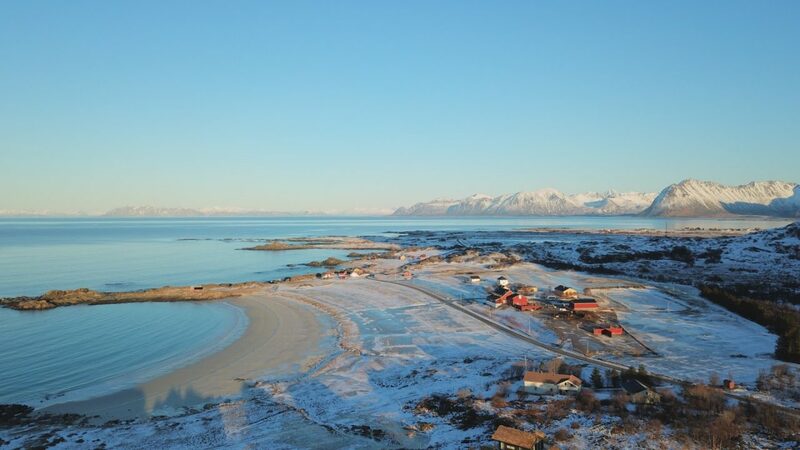 The lodges are north facing with a spectacular view towards the northern lights and the great ocean, which makes them unique in Lofoten. 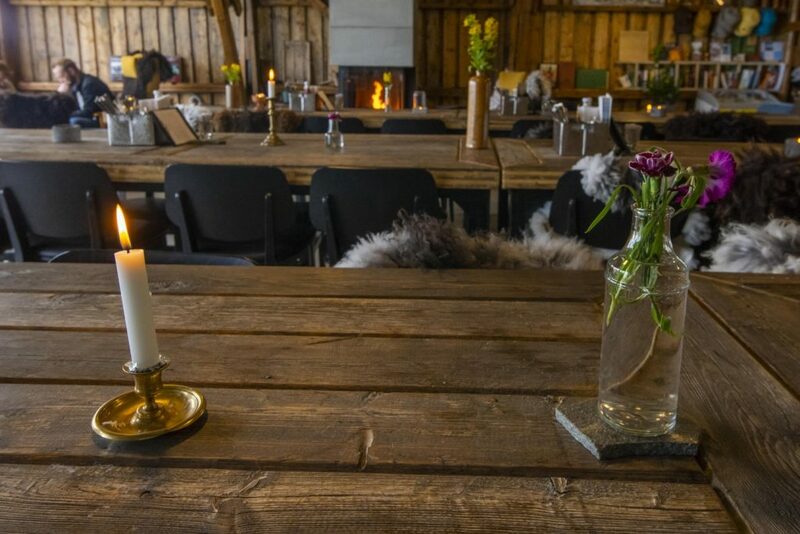 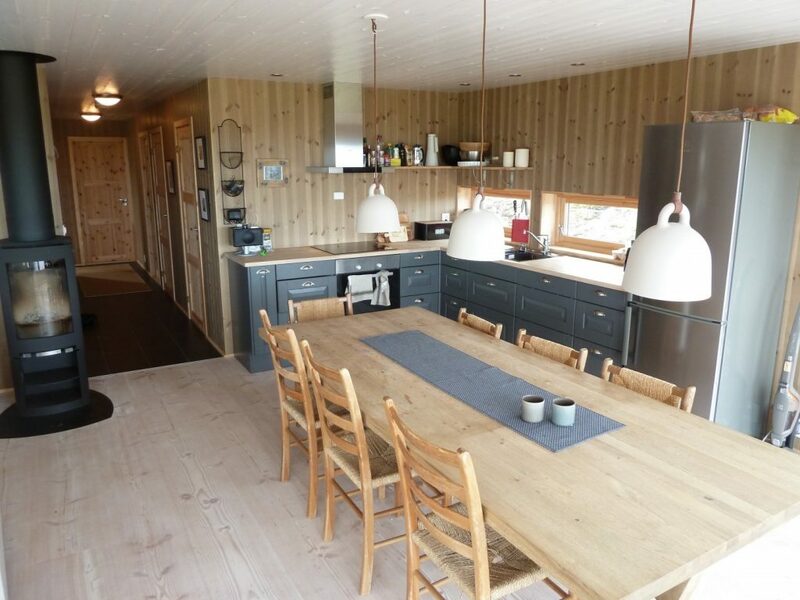 You can buy breakfast at restaurant Låven. 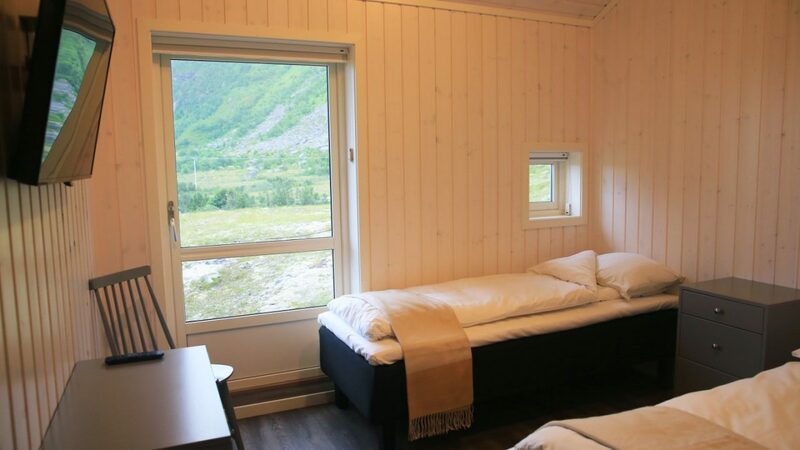 Price pr person: 165,- NOK, and must be booked the latest when checking in. 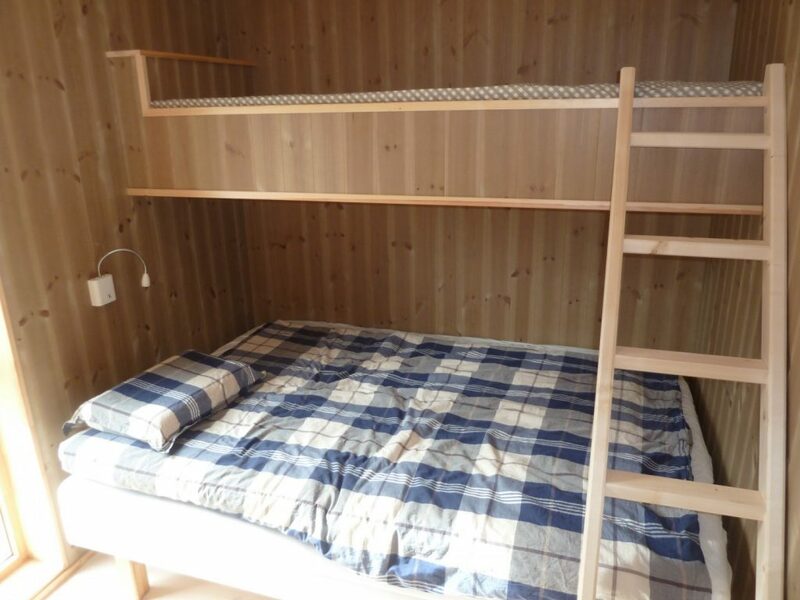 Each of the 8 lodges has three bedrooms with two beds and a small loft with the possibility for an extra bed; a total of 24 rooms. 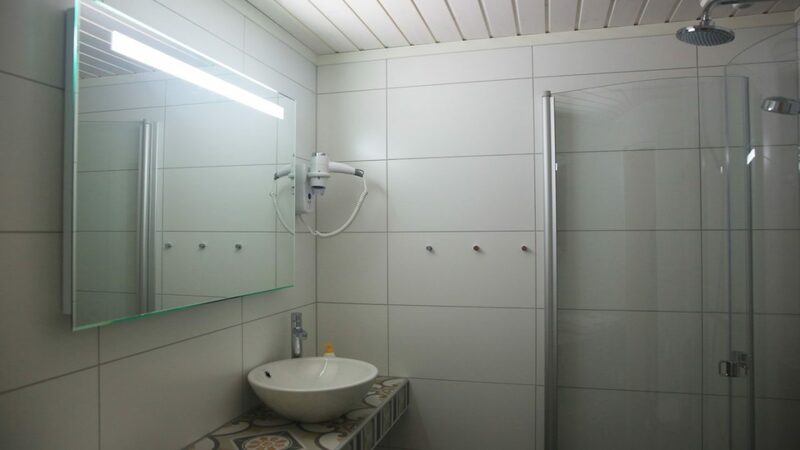 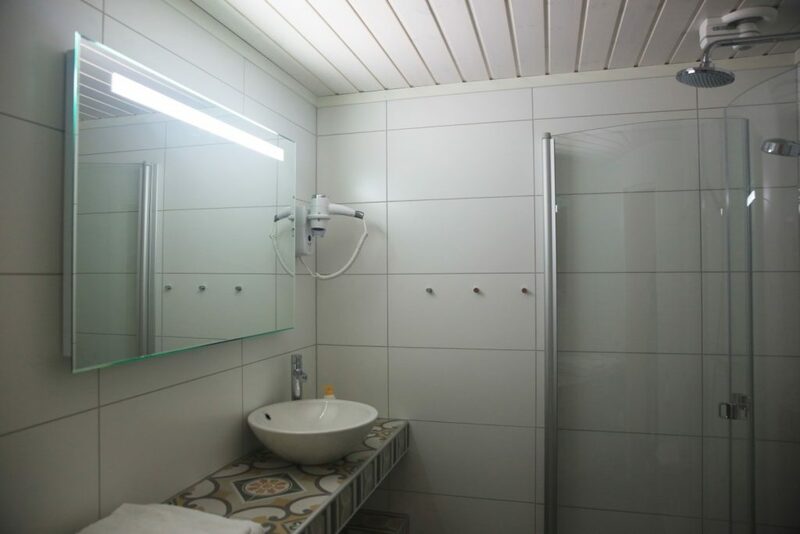 Each room has a private bathroom with shower and WC and is soundproofed (hotel standard). 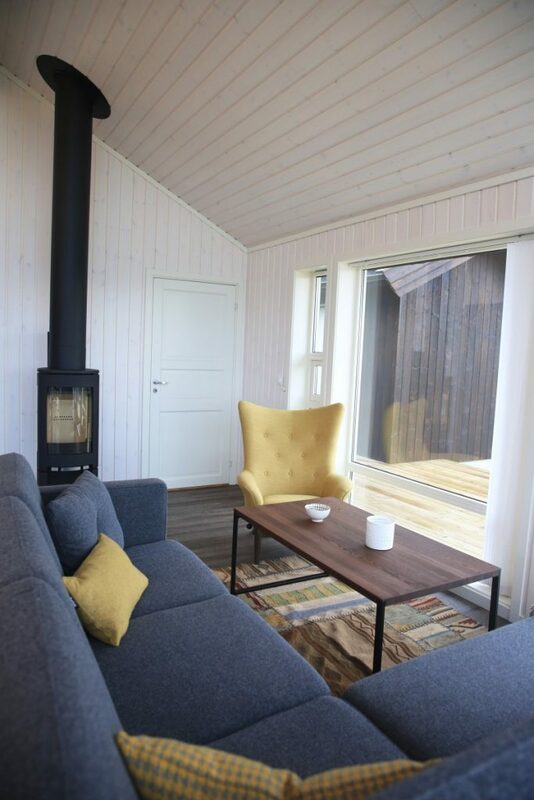 Communal large living room with fireplace, kitchenette and terrace. 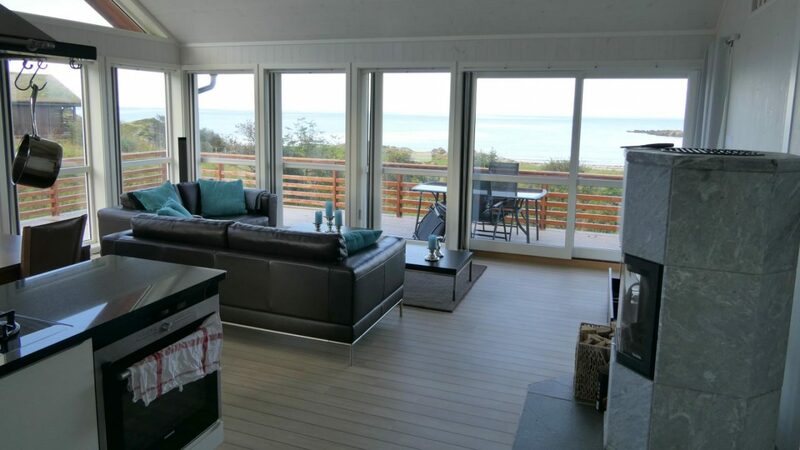 Great view to the north and the big ocean. 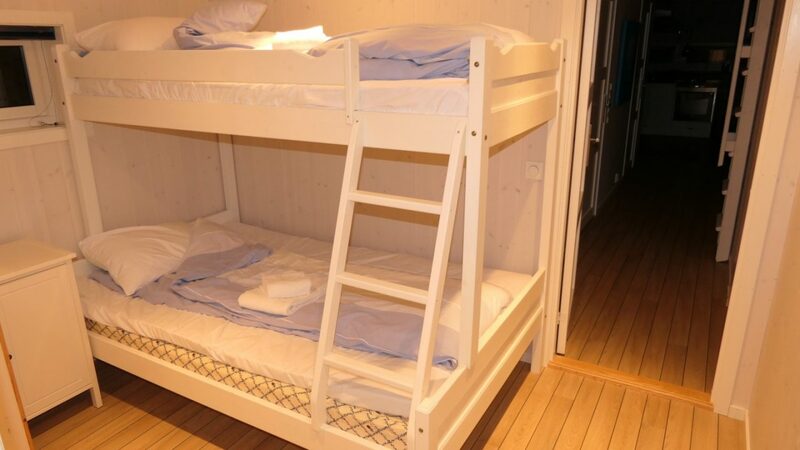 Downstairs: 3 bedrooms, 1 shared bathroom, living room with fireplace and kitchen. 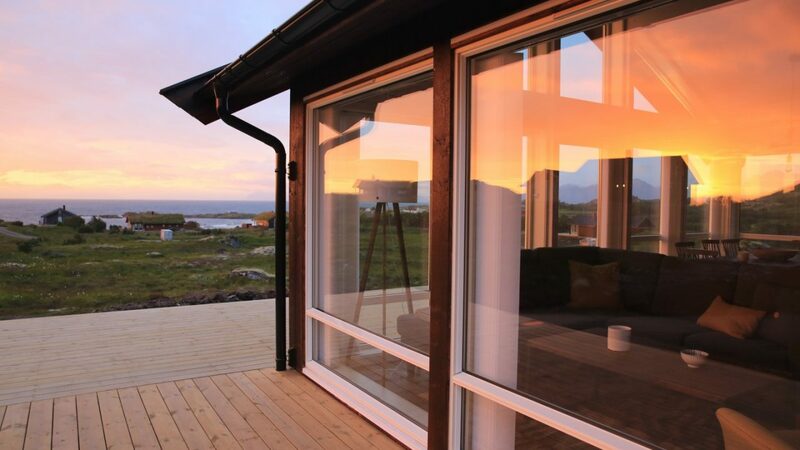 Outside terrace with a beautiful view of the North. 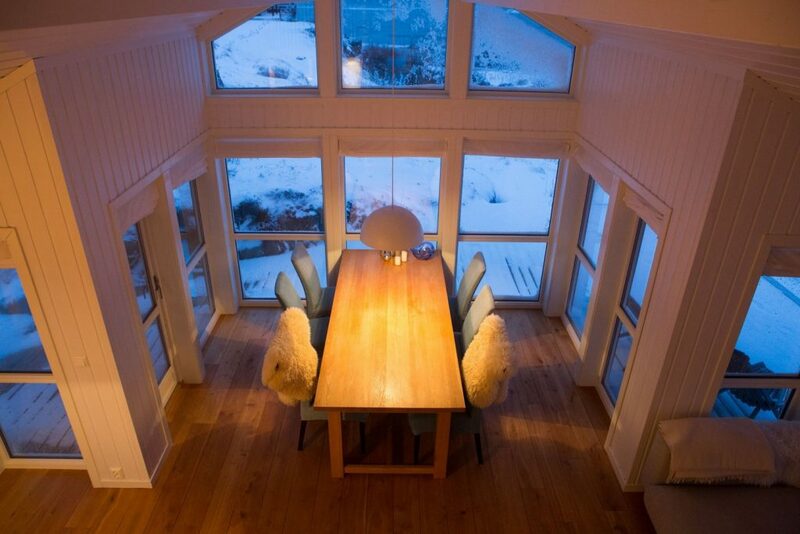 Downstairs: 3 bedrooms, 2 shared bathrooms, living room with fireplace and kitchen. 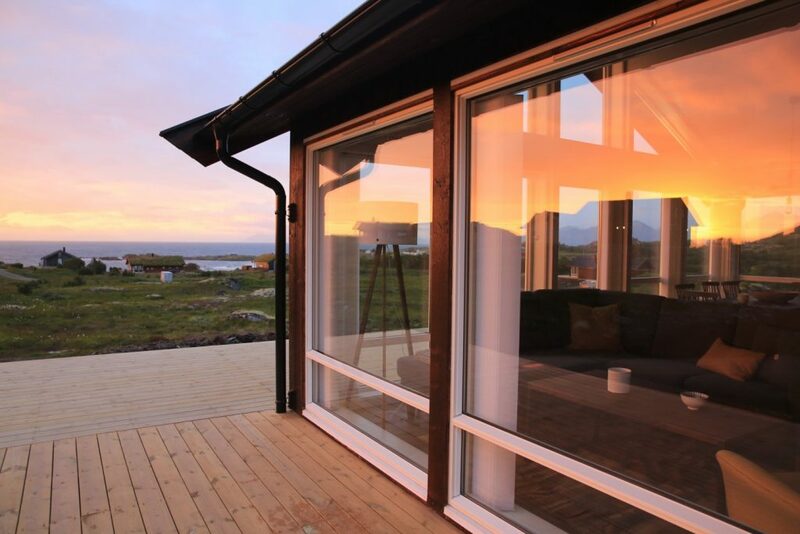 Outside terrace with a beautiful view to the north. 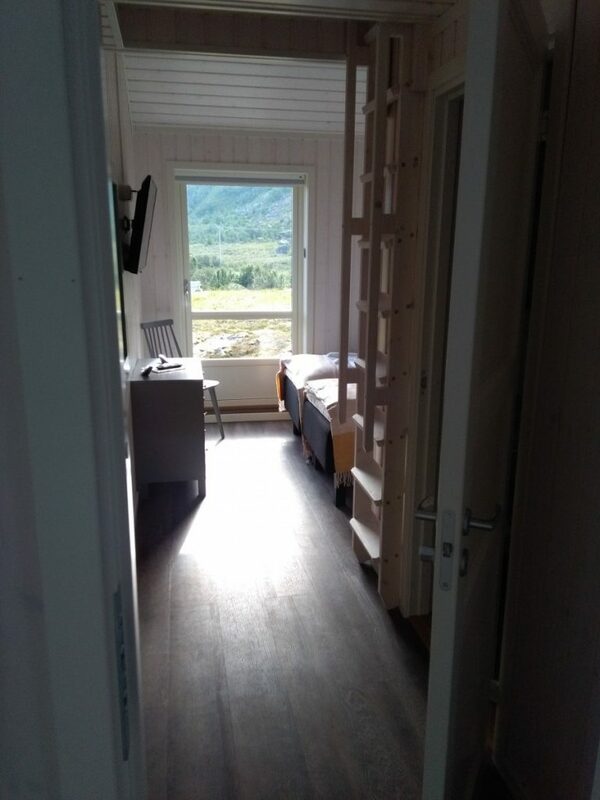 Upstairs: 1 bedroom with 4 beds, 2 additional beds possible in the upstairs living room area – fairly steep steps. 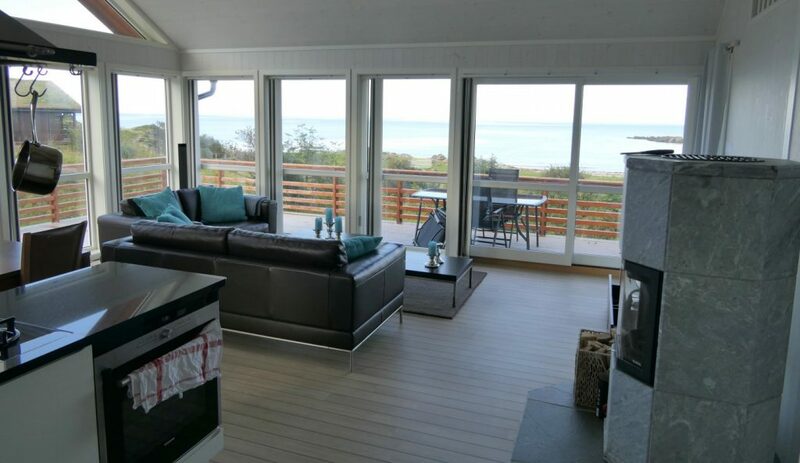 Price for additional persons 7-9: NOK 450,- per person and night. 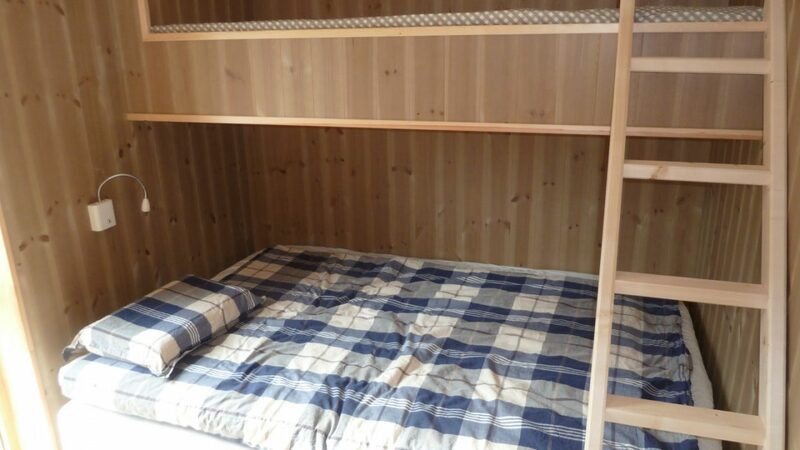 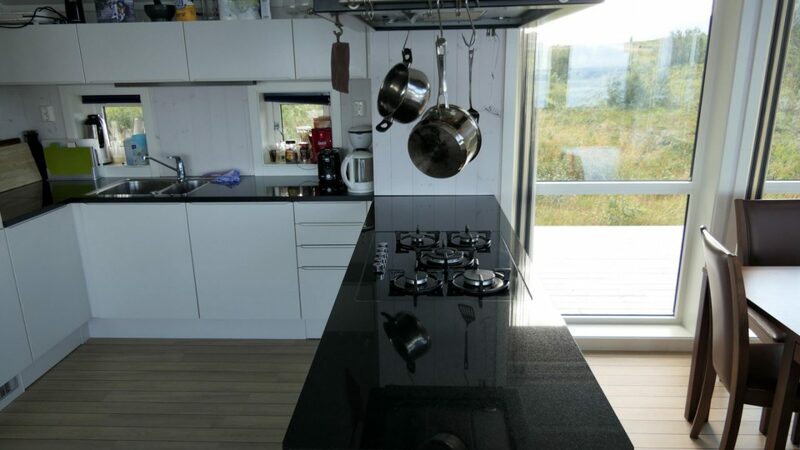 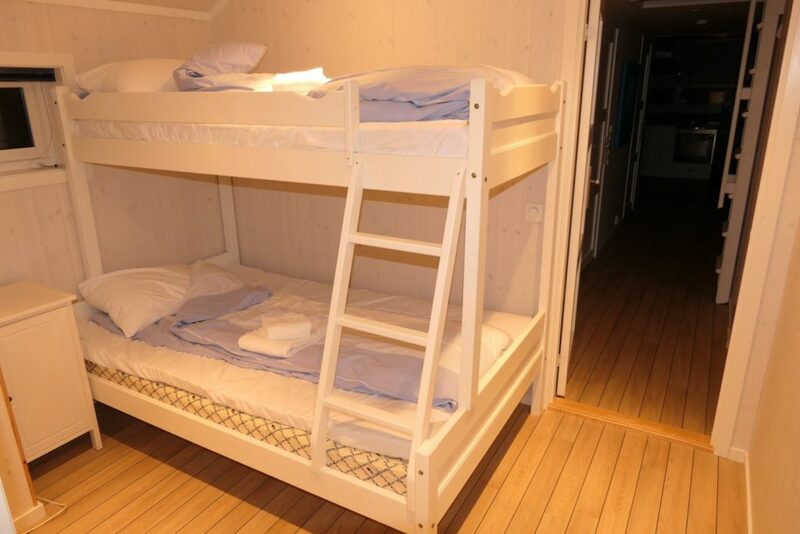 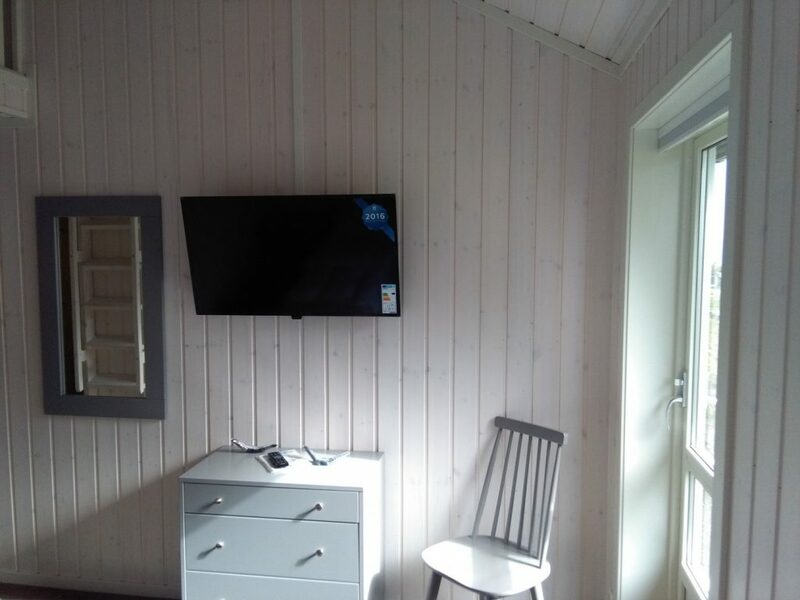 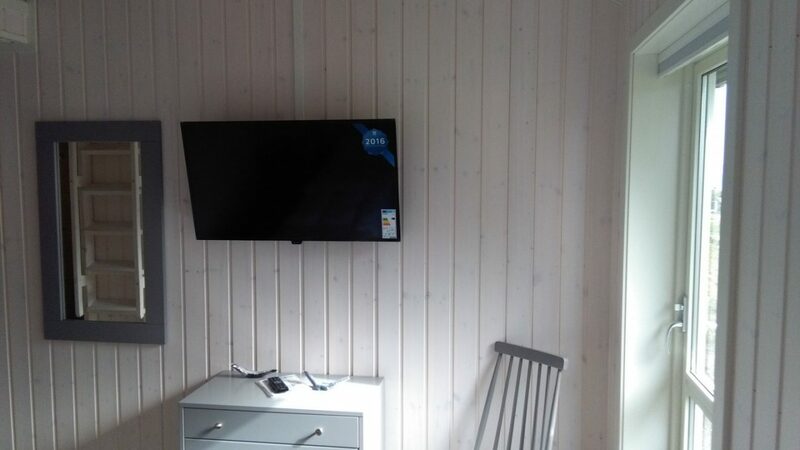 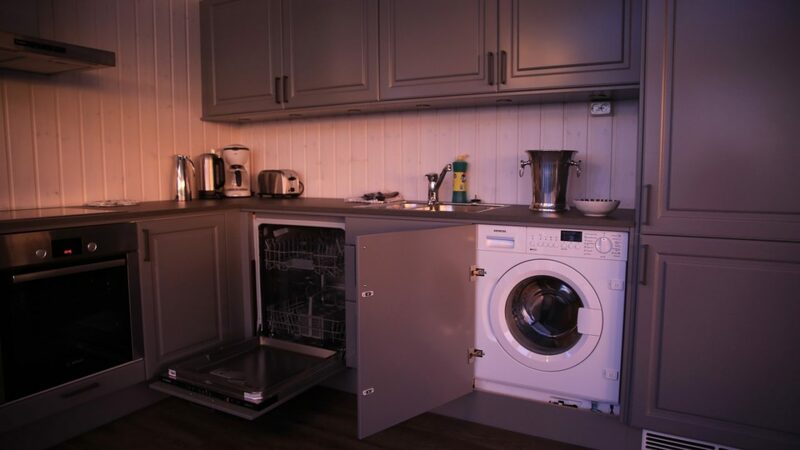 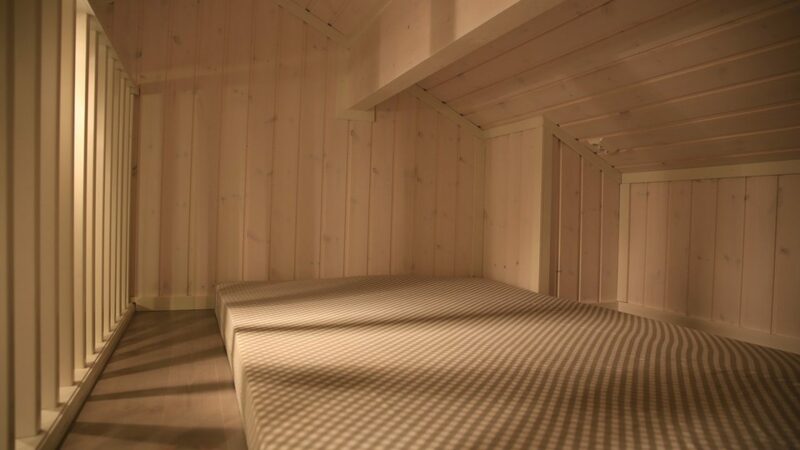 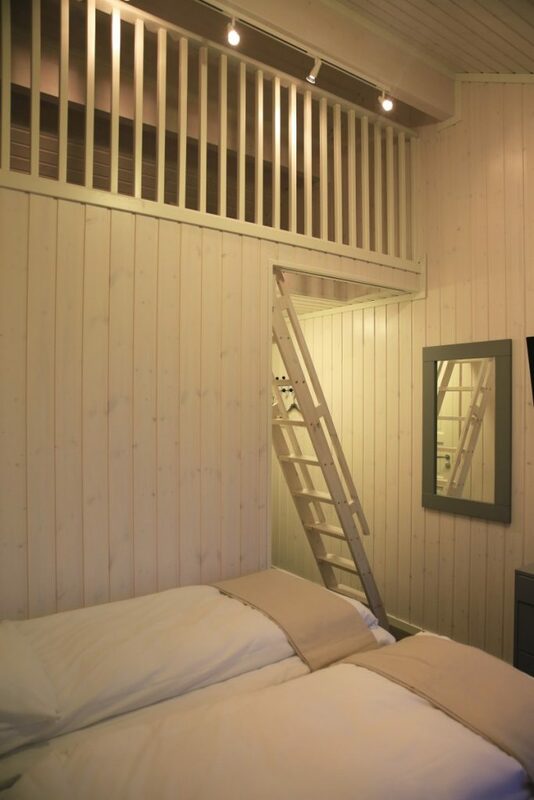 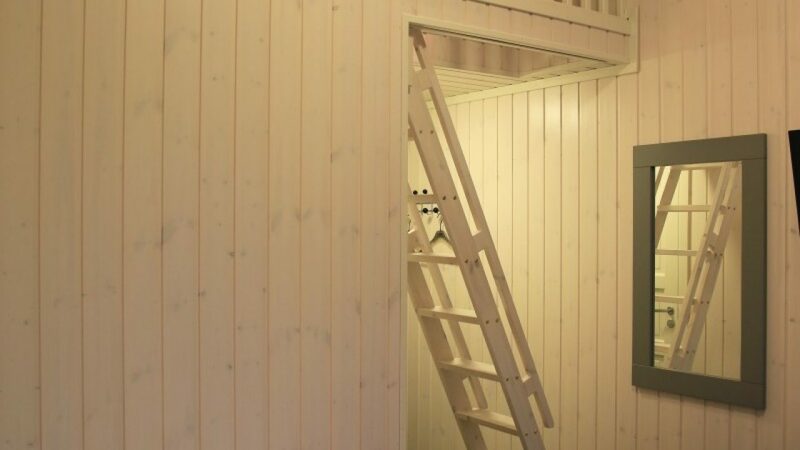 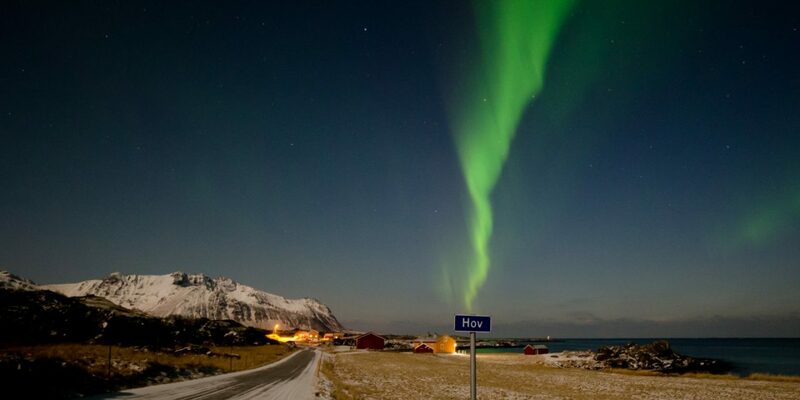 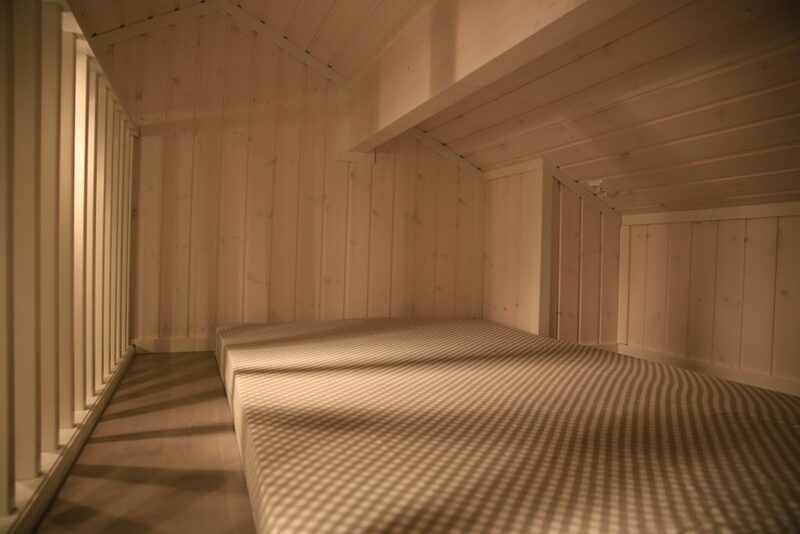 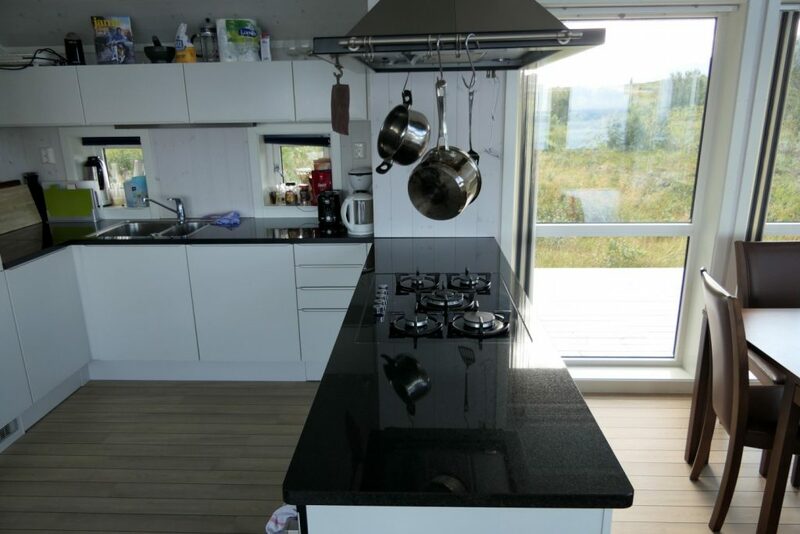 Up to 6 persons NOK 4.000,- per night. 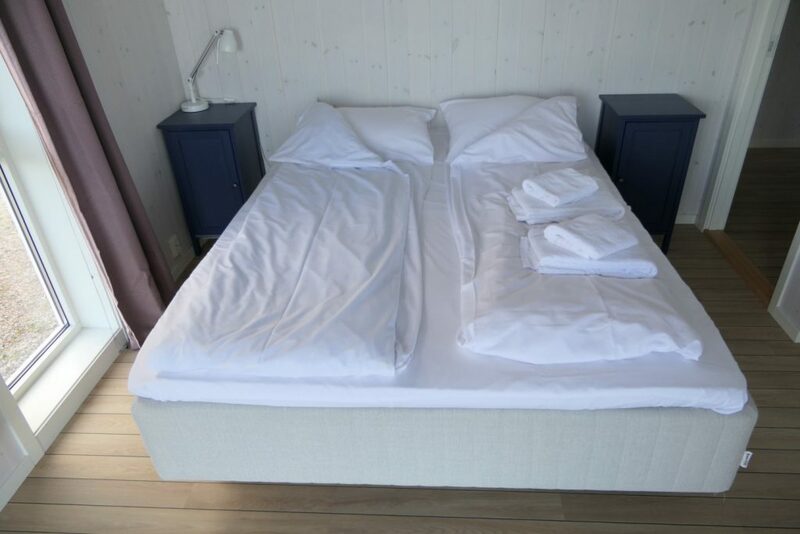 (15% discount when booking 3 or more nights for the entire stay. 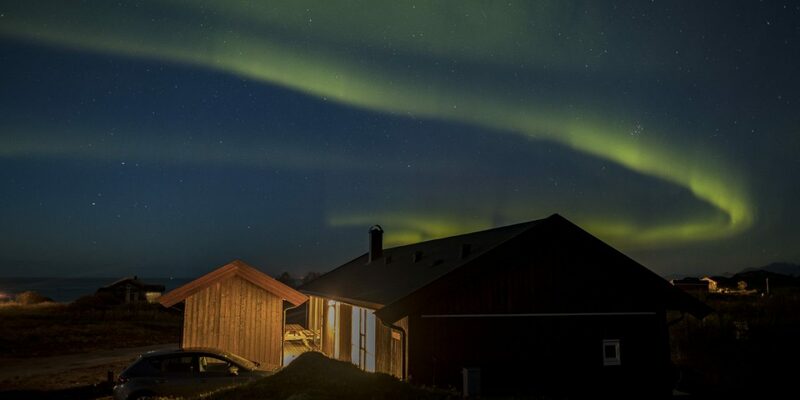 – only in the low season, not June, July, August). 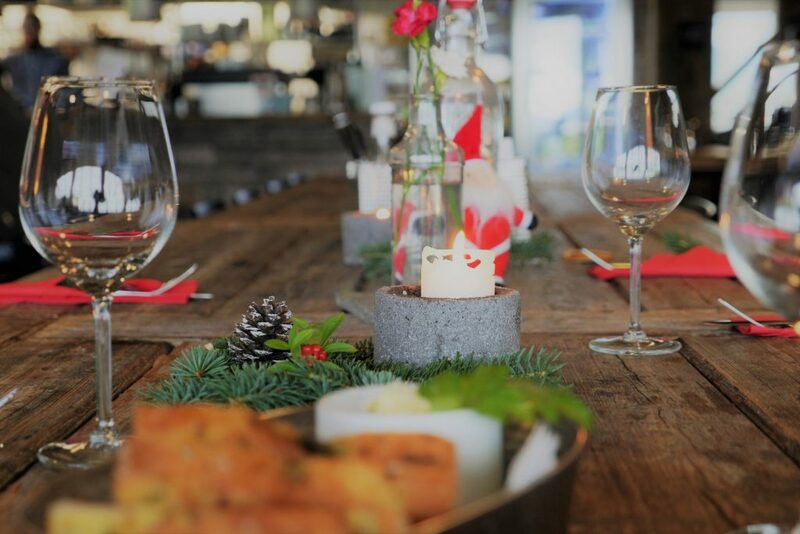 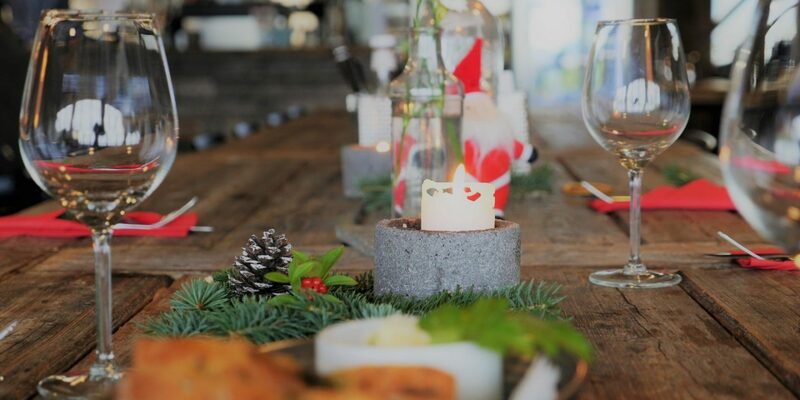 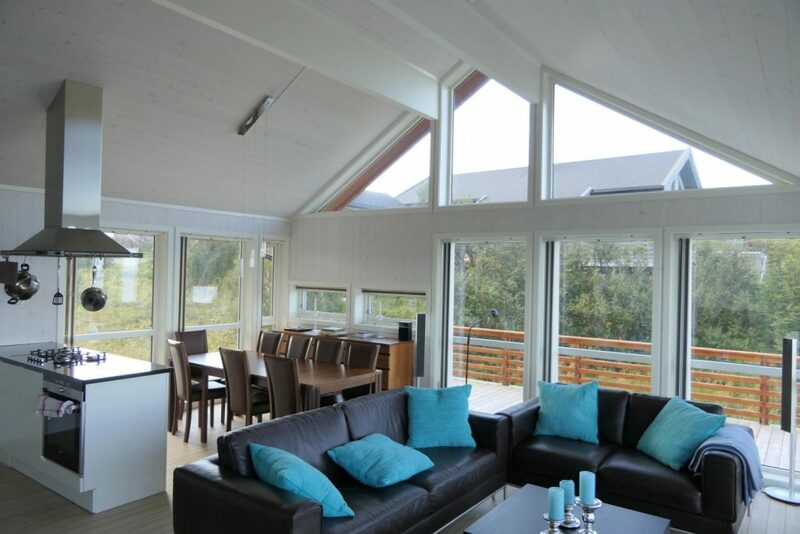 Price for additional persons 7-12: NOK 450,- per person and night. 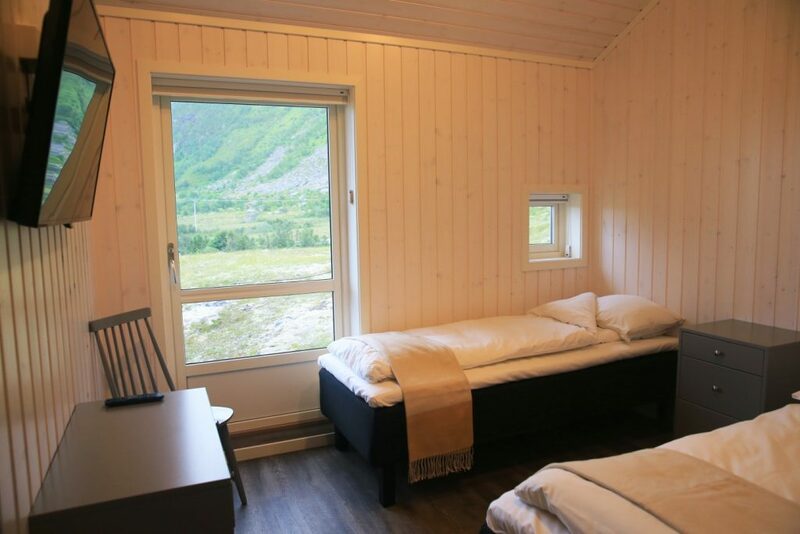 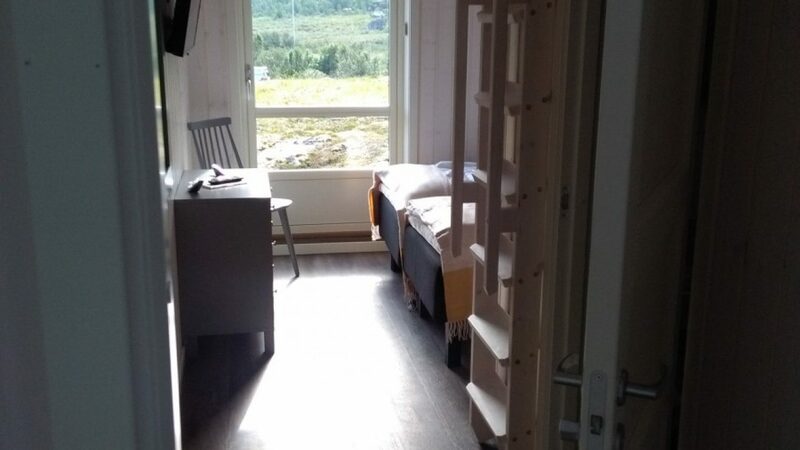 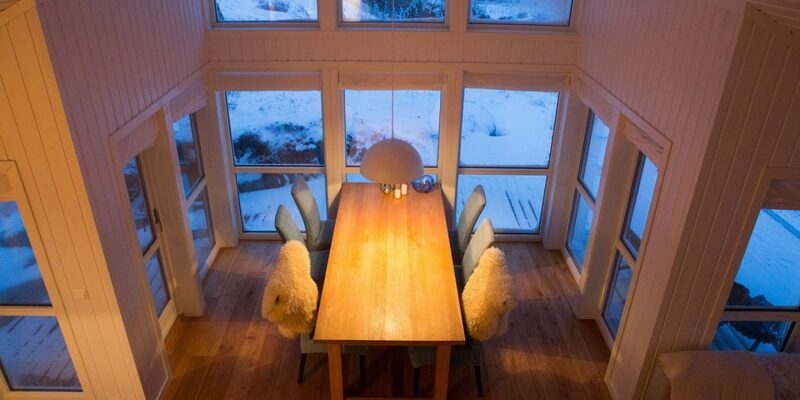 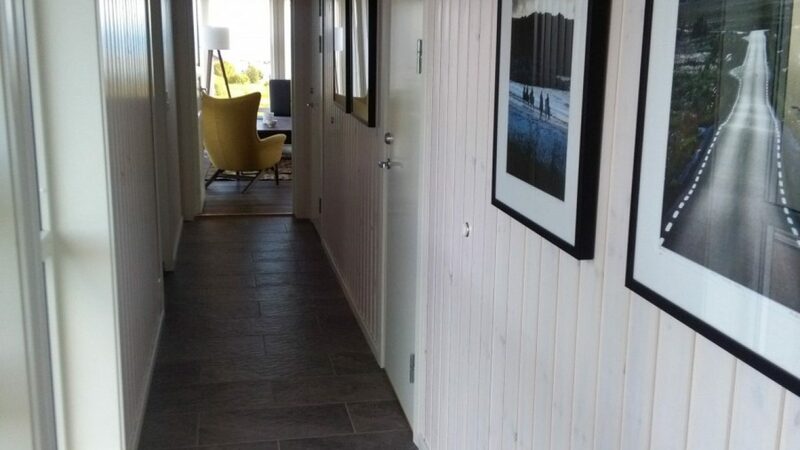 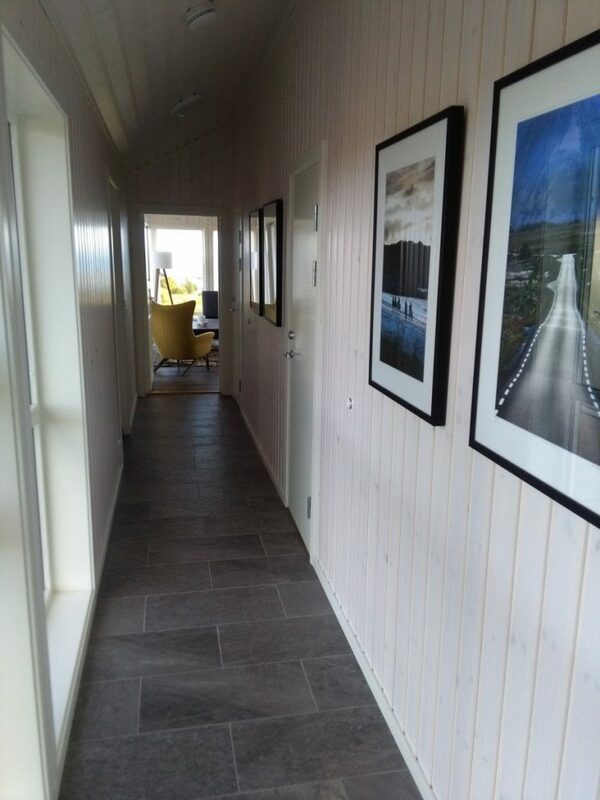 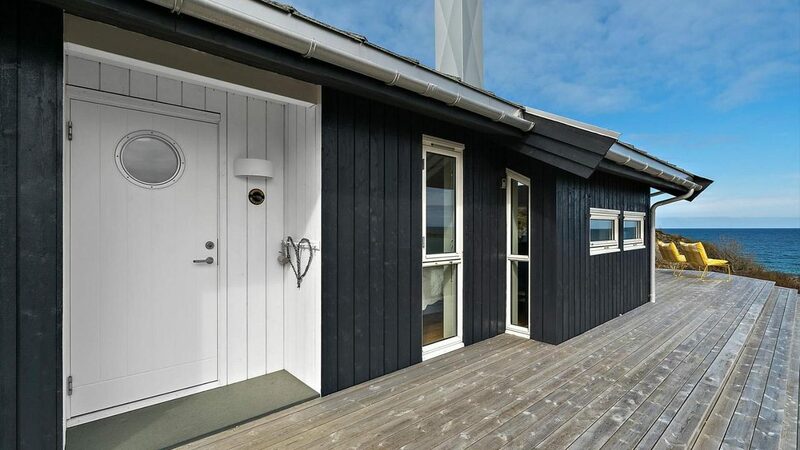 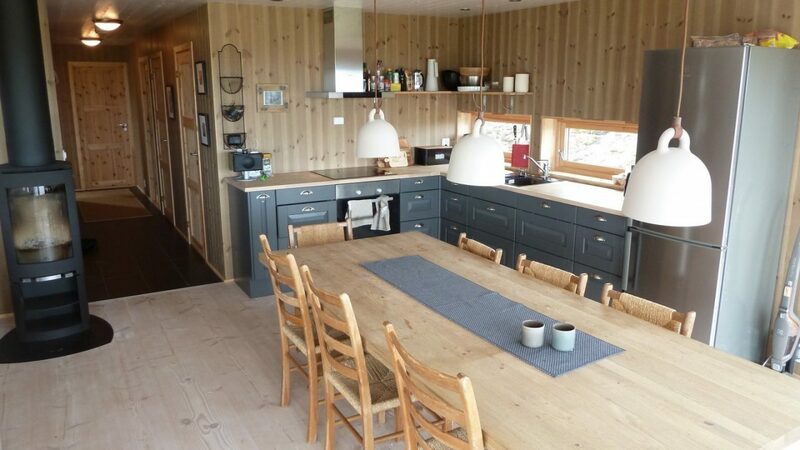 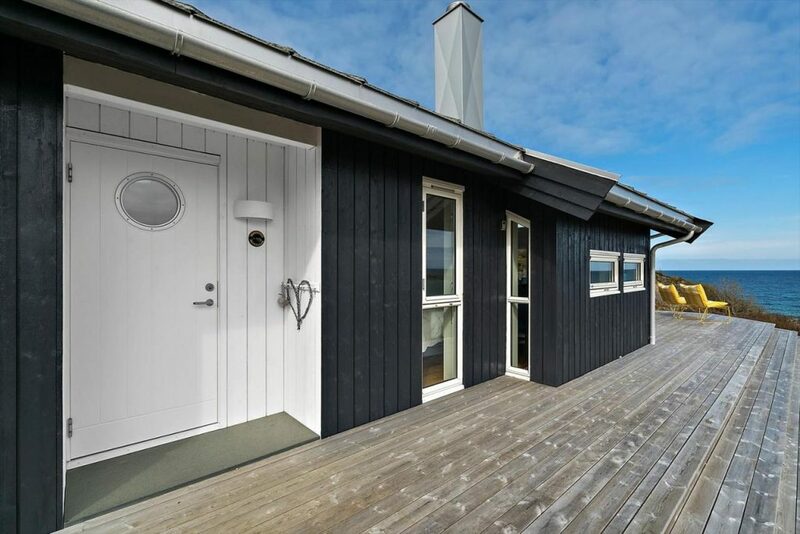 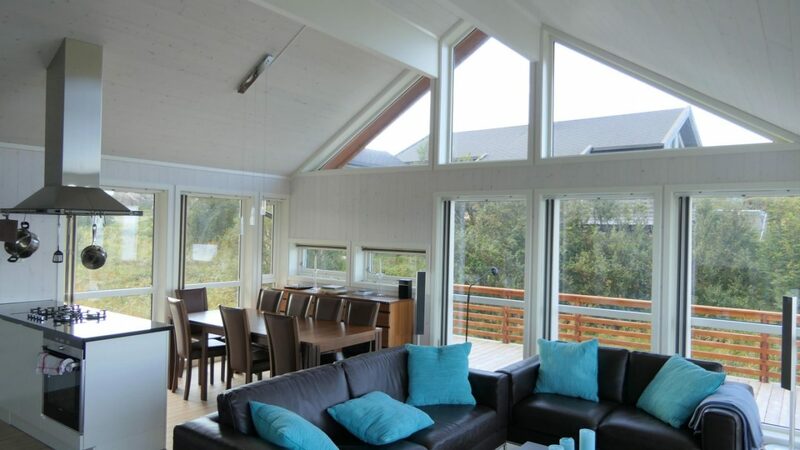 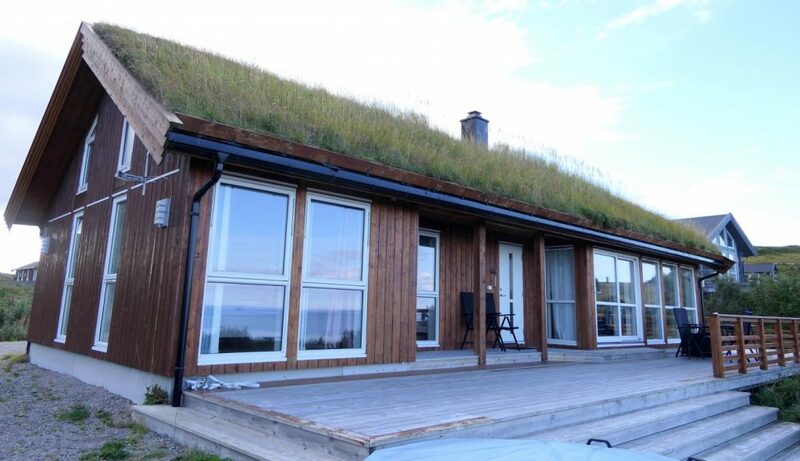 Up to 6 people NOK 4.200,- per night. 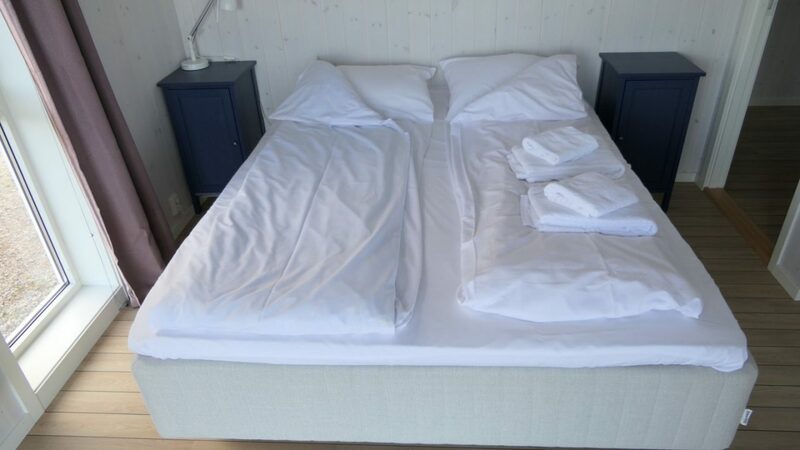 (15% discount when booking 3 or more nights for the entire stay. 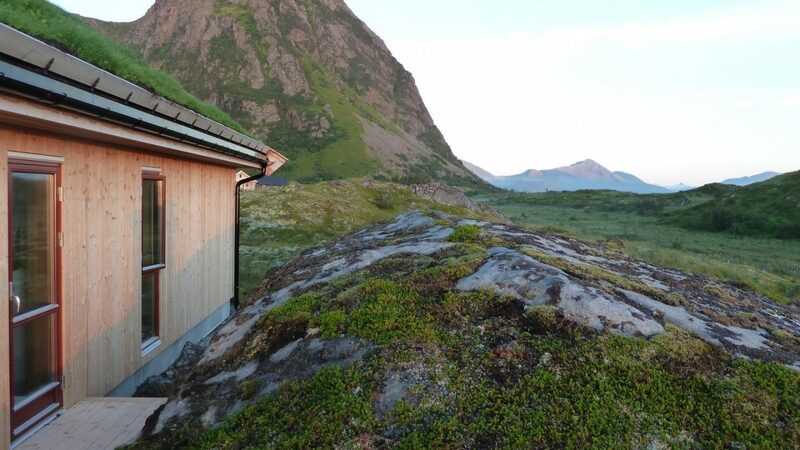 – only in the low season, not June, July, August). 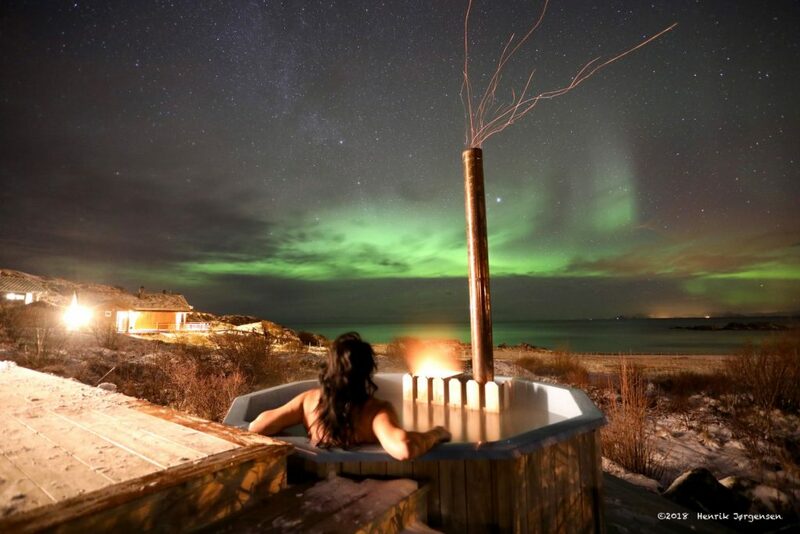 Fee to use the jacuzzi: NOK 1.000,- per use.